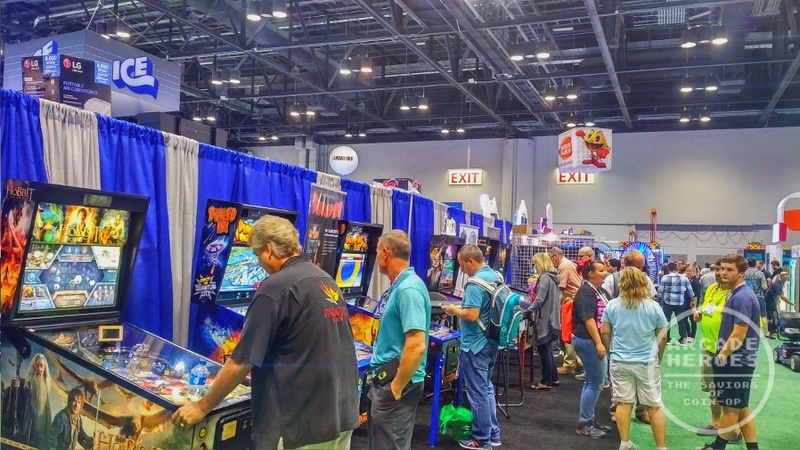 With IAAPA 2017 now in the past, I hope to catch up on news of everything that was there but it is a somewhat daunting task as so many ‘different’ games were on hand. Different in this sense is to say that we’re not comparing racers & light-gun games with each other but there really were a lot of titles around that did things in a new way or in a way that we haven’t seen in a long, long time. I’m quite happy with that to be honest as this gives us the biggest assortment new content I’ve seen since I started reporting about these things back in 2007. Jersey Jack had their full line-up on hand, from Wizard Of Oz to a couple of The Hobbit and Dialed In!. But the main interest for me was the recently unveiled Pirates Of The Caribbean. I’m mostly indifferent about the license, only having watched the first two of the five films, but I was very interested to see the game design. JJP brought a single Standard model to play and after playing it a few times, I think it is a fun game. That’s always important for every pin when the license isn’t up your alley. I was a little surprised by often the three discs in the center were spinning; I don’t know if the character you pick determines how often those function or not. They had another nice looking booth that was similar to the Amusement Expo setup, showcasing the Attack From Mars remake models and Medieval Madness remakes. I had a picture of the booth but it looks like it was on another camera that isn’t with me at the moment so I’ll post it later. We talked about both of these on the site previously, All Stars Baseball and Zombie League Baseball. They are pretty much the same games, differing only in artwork and the sound package. One thing that a pinball player may be surprised by at first is that the controls are all mounted to the front plate instead of there being any buttons on the side. The games have different pitching options (fast ball, curve ball, change position) which you can play single player or with a friend. I only played it single and as you would expect, it’s about timing. A smaller-than-normal pinball will shoot out from under a black flap and you have to make sure to hit it with the bat at the right time to hit one of the position targets at the back of the game. You can get single, double, triple hits, a strike, a foul ball or a homerun. Depending on which positions you manage to hit, the mechanical team inside of the backbox will move around the ball field. You do not play for nine innings on a credit of course; I found what I played to be simple fun. Whether it’s fun enough to translate into solid ROI for the price is another question. Namco had a packed booth this year, combining their equipment along with what Bandai Namco Amusements Europe will sell. That’s why Adrenaline and Raw Thrills product were over there. Putting those games aside, Namco did not have anything brand new for traditional video-only arcade machines, but they did have the modular VR amusement setup, We Play VR on hand. I did not give that a spin after getting hit with some appetite killing vertigo on some other VR games a day previous but I watched people play it and they seemed to like it. It is notable that the new Ubisoft/Triotech venture into VR uses a layout that is very similar to what We Play VR does. Obviously, the content will differ here. 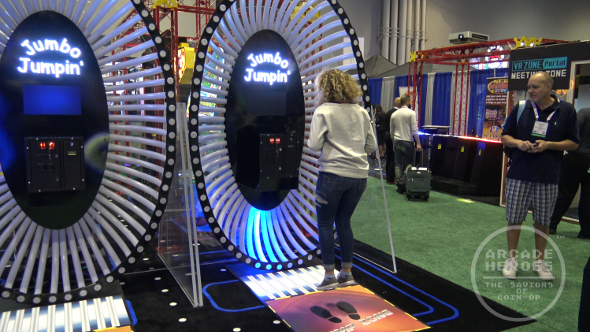 Otherwise, Namco did introduce a new version of their smash-hit redemption game Jumpin’ Jackpot, now called Jumbo Jumpin’ and they also have introduced a 2-player version of Maximum Tune 5. If you weren’t aware, they previously only sold these in packages of 4 with the terminal station; now it will be two with the terminal station. I think this will mean that you will find Maximum Tune in more venues and they will be online. Namco also recently started holding national tournaments for MT; I somehow missed that news but there will be more through 2018, possibly leading up to an update of the Maximum Tune software. They didn’t get into deep details on that yet but did sound pleased with how the game has been doing on the market so far. Namco also had a new Justice League air hockey table to show off; while we did see a prototype version at Amusement Expo, this one was playable and had LED lighting to make it look nicer. Another unique game that I saw was the new Mannequin Challenge by Touch Magix. Based out of India (with a US office in Delaware) and often focusing on floor/wall projection gaming, they are turning heads as they get into the coin-op. They did so earlier this year with their Magix Floor system which has been installed into various FECs and was at the show. But most people seemed drawn to the new Mannequin Challenge. Using a Kinect-like sensor (they stated that it uses their own design; which is also probably better given that Microsoft has ‘canned the Kinect’), all you have to do is stand in place and recreate the pose shown on screen. It has a big library of poses that are randomly given on each play, many of which are pop culture references such as “Our Last Hope” (stand like you are holding a lightsaber in the air from Star Wars), “It belongs in a museum” (pose like Indy with his whip from Indiana Jones) and many others, including internet memes. They use a subscription service for their online functionality, which will also mean that It works for 1-2 players and offers both ticket redemption and a photo booth option. Link to the video on Vid.me or click below.